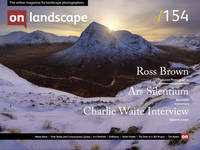 Graeme Green (GG): What's the main appeal for you in landscape photography? Charlie Waite (CW): The faster we're going, as people, the less our feet are actually firmly on the ground. We're becoming very dislocated. We can use the camera to re-engage with ourselves because it can help you notice things that otherwise you might miss. It certainly makes me feel more connected to the landscape and to the world. GG: Landscape photography seems to keep growing in popularity. Why do you think that is? CW: There are very many people who at some stage of their lives, perhaps in their middle age, feel a need to explore any creative impulses that may well have been latent. If that desire can't be satisfied through the normal routes, like cooking, gardening, woodwork, painting, music and so on, people are now realising that the camera is a remarkably creative device with which to express their response to their world around them. GG: How would you describe your own approach? CW: I see it as contemplative, and, using the word daringly, spiritual. I do have feelings about further dimensions. I'm in a state of permanent wonder and relish. The only time I can express that is through the camera. GG: What got you into photography? CW: I'm an Ansel Adams groupie. He was such an amazing technician and interpreter. He had an amazing ability to produce an image that matched human vision, and his approach to dark room work was second-to-none. GG: You were an actor in TV and theatre before you were a photographer. How did the shift to photography happen? I'm an Ansel Adams groupie. He was such an amazing technician and interpreter. He had an amazing ability to produce an image that matched human vision, and his approach to dark room work was second-to-none. My wife was in a big popular BBC series called The Onedin Line, a bit like the Downton Abbey of it's day, and I got really bored of watching the filming. I had a Beetle in the 1970s, so I'd wander off into the Devonshire countryside while she was filming and found myself half-heartedly responding to a tree or a shed or a cloud. When I looked at the photos, I realised I had had a much more profound feeling in those places and that the image hadn't evoked that experience. That was the first sign for me that you have to invest more of yourself into a photograph. GG: Your company Light & Land run photography holidays, and you personally guide some workshops and tours. Can you really teach someone how to be a good photographer? CW: I think you can, especially people who have an understanding of design and good lighting and who can identify all the component parts that go into a landscape photo. You can often tell if you look at someone's house. If their interior design is all over the place and nothing matches, then the chances are that they don't really understand design and form and balance. But many people can grasp the work that's needed and all the different elements that go into a photograph. It can be a hugely enjoyable process to get someone to understand the meaning of perception and defining the objective and how to omit the redundant bits that will deflect the eye from the core of the image. GG: What's the most important element people need to understand? CW: 'Recognising'. One of Ansel Adam's great lines about photography was "recognition and pre-visualisation blended together in a single moment of awareness." It's essential to be able to recognise a combination of shapes, a configuration of lighting, and an orchestration of colours, and then identify the merit of what you're looking at for having a photograph made of it. Another thing that is essential, of course, is not tolerating compromise. GG: Light & Land has been running now for 25 years and the company is celebrating their 'birthday' in 2018. How do you feel about that milestone? We've taken great delight over the last 25 years in seeing a network of communities being established and many enduring friendships formed, all with photography at their core. That's extremely satisfying to be a part of. GG: How has photography changed over the last 25 years? CW: Digital has offered wonderful opportunities for so many millions of people to explore the magical world of photography. For the world and its people, photography has now become the new common language. Yet some statistics show that 95 percent of all photographs made are either deleted or confined within an external hard drive, never to be set free. Digital has brought with it a degree of recklessness, which for the photographer's journey could amount to a trial-and-error approach. For the beginner photographer, that's not a crime and it can play an important part in the early stages of their perception and the business of making images. Ultimately, though, less trial and error and more restraint are encouraged as an approach. Either way, over the last 25 years, photography has given a very large number of people enormous creative joy, and that is what I care about more than anything. Irrespective of film or digital being the method of capture, the composition remains the most elusive and, subsequently, the most rewarding aspect of photography to achieve an understanding of. It was this way 25 years ago and it will remain so, I am sure. GG: What's your favourite destination for photography? CW: France. I think it's the most undiscovered country in Europe for landscape photography. I know a lot of people go to the Dordogne, but I prefer a department called The Lot. It's an unusual one. I like that part of France enormously. I never see any tourists there and the roads are quiet, so you have plenty of time to pause, which is important for landscape photography. The other thing that's lovely is it's full of little cameos. There isn't a lot of the 'big, grand scene', which I'm not really very good at. I find lots of little minor pieces, perhaps not more than a couple of hundred metres wide, that you can just build a little landscape study out of. I love that. GG: Where else do you like to explore with your camera? I enjoy spending time in Death Valley and the slot canyons in Utah. Yosemite National Park is jaw-dropping stuff. Ansel Adams was there 50 years ago doing his thing and it's the most visited national park in the world, but if you get there, it becomes yours. I've been lucky to travel to many other parts of the world, including India, Namibia, Bhutan. Inle Lake in Myanmar is another favourite. I spend a lot of time in Europe, though. Tuscany was the first place I went to with my landscape photography hat on, having been dumped by the acting profession after 10 years. I remember my mother always saying: "You've got to go and look at landscape paintings. Look at the Renaissance paintings and look, in particular, at lighting". In the UK, Glen Coe in Scotland looks good in any weather. It's a classic, dramatic Scottish landscape. Yorkshire also gives me an enormous amount of pleasure. GG: Do you have a favourite place to take other photographers when you guide tours? CW: Tuscany. I don't think it always needs to be somewhere complete exotic, the so-called landscape 'Meccas'. The best places have a wonderful variation of landscape, water, low-lying hills or mountains, and at the same time, you can keep photographers stimulated with urban situations and strong architectural challenges, so they keep visually agile. One day, you might go to an urban setting, and then the next day a beautiful pastoral setting where not a single building can be seen. That keeps people on their toes. It's very important to not be repetitive. GG: Do you always carry a camera when you travel? CW: I definitely do. In a funny way, it's a curse being a landscape photographer. I find myself estimating everything as to the merit of what I'm looking at may or may not have to be photographed. It's difficult to disengage. But what I love about that is it heightens my sense of awareness by a million times. I bore people crazy by saying "Look at that sky", "Look at the light on that leaf." I'm in a state of amazement. It's weird, really. I can't go from A to B without noticing everything. Do you have a question you'd like to ask Charlie Waite? Send us your question by Monday 5th March and we will send them to Charlie and will publish the responses in a future issue. Charlie Waite is one of our speakers at our Meeting of Minds Conference this 2nd - 4th November at Penrith, Cumbria. Early bird tickets are available until 1st May at £195. Find out more. Charlie Waite's new E-Book 'Beyond The Photograph' is out on Feb 01, 2018. See https://www.charliewaite.com/ for details and more on Charlie Waite's work. Charlie is also celebrating Light and Land's 25th anniversary with an exhibition, ‘25 years of Landscape Photography with Light and Land’ at the OXO Gallery on London’s Southbank from July 18-22, featuring photos by Charlie Waite, Joe Cornish, Doug Chinnery and more.